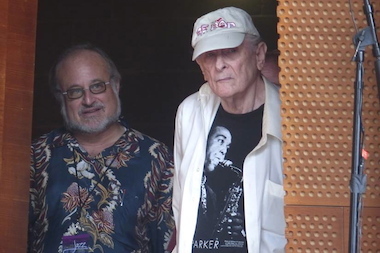 Jazz Showcase owner Joe Segal (r.) and critic Neil Tesser at the Chicago International Jazz Festival in August. SOUTH LOOP — Joe Segal, the impresario who has championed jazz in Chicago since the '40s, gets a street named after him in a ceremony set for 5 p.m. Wednesday. Segal, whose Jazz Showcase returned to the South Loop six years ago after an extended earlier stay at the Blackstone Hotel, will have a street in front of the club at 806 S. Plymouth Court named Joe Segal Way. "Joe Segal’s lifetime of work as a jazz presenter has brought untold thousands of visitors to Chicago," said Ald. Bob Fioretti (2nd). "He also helped to establish the Jazz Institute of Chicago, which offers jazz training and concert experiences to students in Chicago Public Schools." Fioretti has also introduced a resolution honoring Segal in the City Council. "He stuck it out," said Chicago jazz critic Neil Tesser. "By keeping this place going ... at various places, for the better part of 65 years, Joe has continued to create a stable jazz presence at times everybody else gave up on it." Segal, 88, began booking shows while a student at Roosevelt University in the '40s, when he also got to know future Chicago Mayor Harold Washington, a fellow jazz aficionado. Segal presented Charlie Parker and Lester Young under the bill of what he was even then calling the Jazz Showcase. Parker would later be honored with a monthlong celebration of jazz saxophonists every August at Segal's club, which moved from place to place over the decades while thriving throughout and bringing the biggest names in jazz to Chicago. According to Fioretti, Segal formally opened the Jazz Showcase as a venue in 1970 on Rush Street. It moved to the Blackstone in 1982, and returned to the South Loop on Plymouth Court six years ago, after spending extended runs on Grand Avenue in River North and in Lincoln Park in between. Segal's national and international honors include being declared a Master of Jazz by the National Endowment for the Arts earlier this year. "That's a pretty big deal," Tesser said, adding that Segal was one of the first club owners so honored.